The Tennis History section is one of my favorite sections on Tennisplayer, for two reasons. First, it's the quality of the writing by Allen Fox, Ed Atkinson, and Trey Waltke. Second it's the chance to find out what the great players of the past actually were like. If you are passionate about tennis, then learning to understand tennis history adds an entirely new dimension to your appreciation of the game. Allen Fox's pieces on Playing the Greats are small masterpieces. Allen was an elite world-class player in the 1960s, has a PhD in psychology, and is one of the most penetrating and concise observers ever to write about the game. His tactical and emotional portraits will give you a sense of what it was like to actually face legends like Pancho Gonzales, Roy Emerson, and Rod Laver-- what they were like as players and as people. Ed Atkinson's wonderful portraits of other great players such as Don Budge and Bill Tilden are equally engaging and revealing. 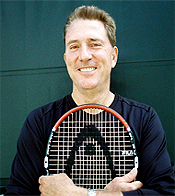 They are based Ed's own experiences as a former top college player and life long member of the legendary Los Angeles Tennis Club. The portraits are drawn from Ed's video masterpiece, Kings of the Court, the single best treatment of the history of the game ever created. In a second series of commentary pieces, Ed also adds his uniquely fervent and provocative comparisons between the great champions of yesterday and those in the modern game. Trey Walke has been a friend of mine since our days in Missouri Valley junior tennis in the 1960's. Then and now he was known for his sharp wit, down to earth personality, and graceful attacking style. Trey became a top 50 player on the tour for over a decade, and knew players like Vitas Geralaitus and John McEnroe intimately. What was Vitas really like? How did it feel to face an obscenity spewing Johnny Mac at the U.S. Open? Find out here.